Scaling and root planing are usually a dentist’s first line of defense against the early stage of gum disease, better known as gingivitis. Periodontal scaling and root planing is a “deep cleaning” used to treat active periodontal, or gum, disease. Gum disease occurs when the gum tissue becomes infected resulting in the loss of bone supporting the teeth. Scaling and root planing procedure removes infection and plaque from under the gums to help with healing and preventing further bone loss. Scaling and root planing, along with excellent home care and routine visits, can help to maintain gum health to ensure a healthy smile. Most of the time, a deep cleaning can be completed over the course of one or two visits, after which a patient will need to return to Ridgepointe Dental for a follow-up. 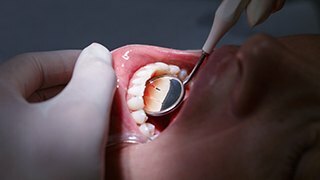 If you have red, swollen, or tender gums that tend to bleed whenever you clean your teeth, it may be time for you to get a deep cleaning. To schedule an appointment, please contact us today.